The Topshop sale is a good time to stock up on more ‘limited edition’ type pieces at a fraction of the price. I have listed some pieces which I have bought and found to be of good value in terms of distinct style and reasonable price. This Topshop Unique’s structured cotton ‘Tiller’ dress was originally £145 and is now £30 in the sale. You can find it here. Part of the instantly shoppable runway collection debuted at London Fashion Week, it’s designed with black stripes and has wide T shirt-style sleeves for an oversized look. The adjustable side panels with button tabs cinch the waist. Balancing the silhouette with broad t-shirt sleeves, this vivid yellow and black striped cotton dress is punctuated by mother of pearl detail buttons. It is made of 100% cotton making it perfect for hot summer days. There is also the pink version on the Net-a-Porter website at the sale price of £45. You can find it here. This Topshop Unique shirt was originally £115 and is now £20 in the sale. You can purchase it here. 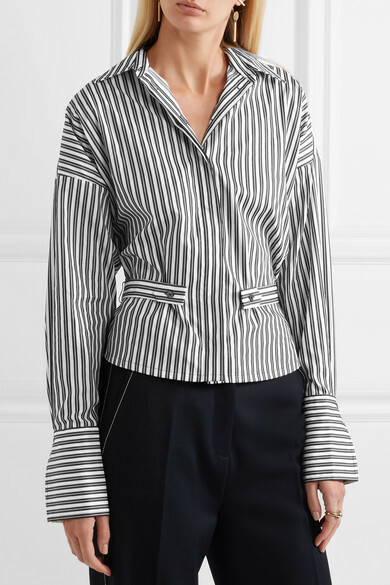 Net-a-Porter is selling the same shirt in their sale for £69 and can be found here. This 100% cotton shirt is cut in an oversized silhouette with dropped shoulders and tabs to define the waist. It has extra long cuffs that completely cover your hands – a key trend for spring/summer. The Tiller shirt features novel tailoring with dropped shoulders and adjustable side tabs that cinch the waistline for a feminine fit. This concealed button-up in black and white striped cotton is finished with oversized cuffs and punctuated by mother of pearl detail buttons. There is also the pink version which can be found here for £20. This dress looks like a Zimmermann piece. The original price is £95 and is on sale for £20. You can find it here. This dress is reminiscent of Self Portrait or Thread & Needle dresses but for a much lower price. The original price is £150 and is on sale for £40. You can find it here. Opt for total sophistication in this laser cut bardot dress in mint, with trim detail and skinny straps. In a midi cut, it comes with a gorgeous full skirt. This dress runs small so I bought a size up. There are is also a tall and petite version for £20 in the sale which you can find here and here. This utility style is a must-have this season was originally £75 and is now on sale for £30. You can find it here. 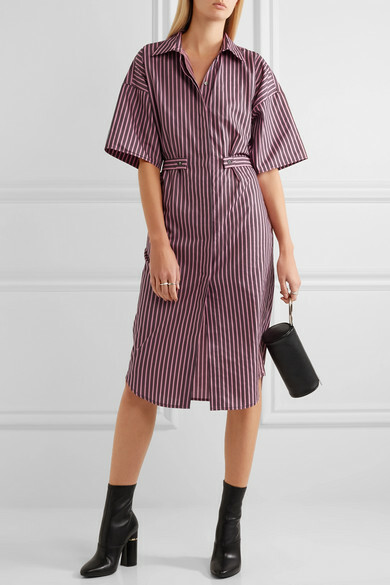 This dress with this unique take on the stipe shirt dress trend. In an oversized, midi cut it comes with large cuff detail, a statement wrap-around belt and a traditional button-down placket. It is made of 100% cotton and is finished with a practical pocket to one chest. This Aster ruffled printed silk crepe de chine top was originally £135 and is now in the sale for £20. You can find it here from the Topshop website or here from Net-a-Porter. This Topshop Unique’s Aster top is cut from 100% silk crepe de chine printed with wild flowers and white stars. Detailed with a plunging neckline and ruffles at the waist, this piece has dropped puff sleeves that create the illusion of slimmer shoulders. There is also a lighter colour in the sale for £20 which you can find here. This blouse will look just perfect with the pink or off white skirt at the end of this post. This 100% silk blouse was £135 and is now £40 in the sale. You can find it here. This blouse is from Topshop Unique’s Spring ’17 collection which pays homage to the London’s club scene in the ’80s. This silk-jacquard blouse is designed with a retro-inspired silhouette that cuts at the slimmest part of your waist and is finished with shiny snap fastenings.